The elements that make up Cleveland are unique to the city, as almost every city portrays. The difference here are the lines that separate societal expectations, trends and culture are more blurred than many other cities. We see this with the overlapping of districts, the mixture of race and culture and the physical characteristics of the city. However, there are still gaps within the city and suburbs of Cleveland in terms of programming, transportation and recreation connections that if resolved and meshed would challenge the city to become an interconnected conversation. 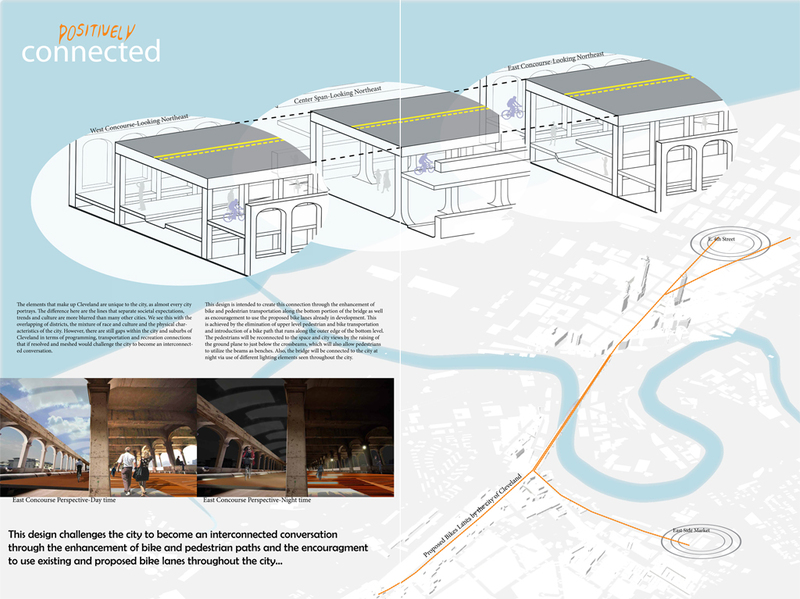 This design is intended to create this connection through the enhancement of bike and pedestrian transportation along the bottom portion of the bridge as well as encouragement to use the proposed bike lanes already in development. 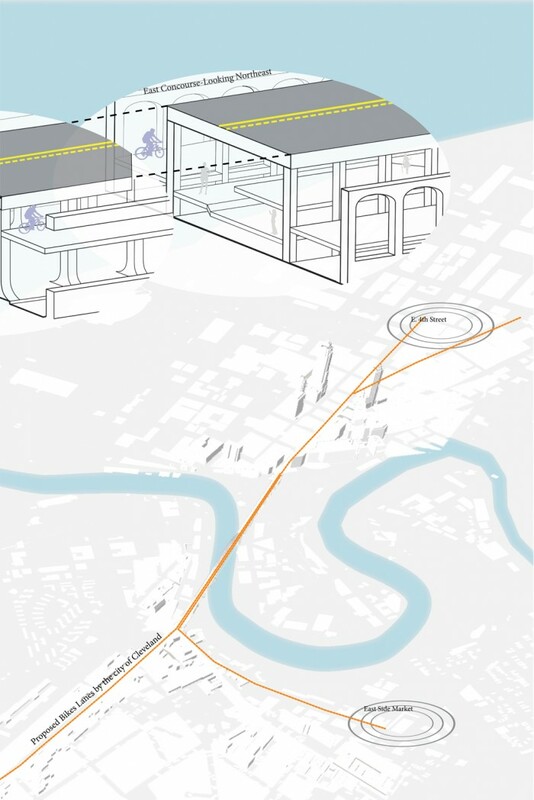 This is achieved by the elimination of upper level pedestrian and bike transportation and introduction of a bike path that runs along the outer edge. 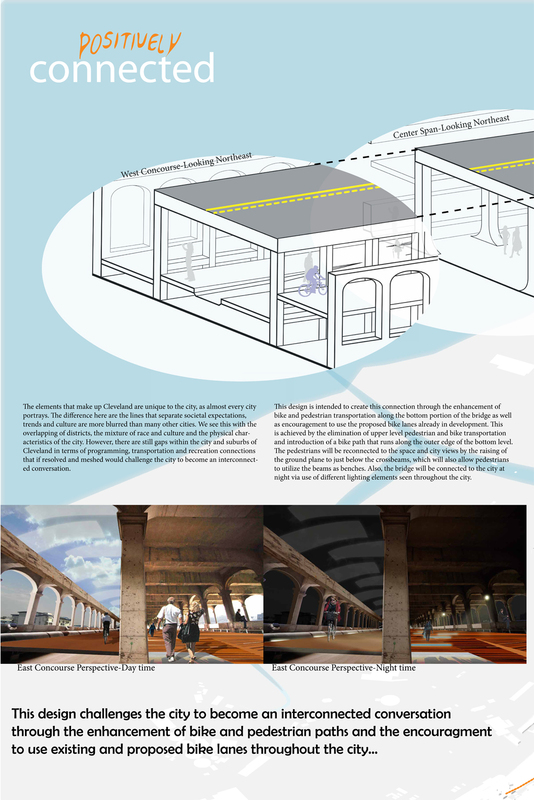 The pedestrians will be reconnected to the space and city views by the raising of the ground plane to just below the crossbeams, which will also allow pedestrians to utilize the beams as benches. Also, the bridge will be connected to city at night via use of different lighting elements seen throughout the city.